FAA’s forecast indicates that general aviation jets will be the fastest growing segment of aviation between 2006 and 2016, flying an increasing number of hours each year. This amounts to an average annual growth rate greater than 10 percent. The FAA's forecast also envisions the introduction of roughly 9,000 new business jets during that time period. Whether they fly to large airports or small airports, VLJ use of terminal airspace in congested metropolitan areas will drive FAA costs and delays. The report, released August 24, compares eight VLJ forecasts. The GAO states that most of the forecasts examined predict an average of about 5,000 VLJ deliveries within 10 years worldwide. This means that the impact on airspace will be minimal at best. "The report validates AOPA's assertion that VLJs won't darken the skies," said Andy Cebula AOPA executive vice president of government affairs. "And VLJs certainly aren't projected to be enough of a presence in the aviation industry to be considered in the current FAA funding debate." Between 3,000 and 7,600 aircraft are forecast to be delivered as early as 2016 and as late as 2025. But those numbers depend largely on various opinions about the use of VLJs for per-seat air taxi operations, according to the GAO. "The system is in place today to accommodate the entry of new aircraft into the National Airspace System (NAS)," said Nicholas Sabatini, FAA associate administrator for aviation safety. "This is nothing new for the FAA. From when FAA's predecessor agency certified the Buhl Airster in 1927, to the introduction of the Boeing 707 and the dawning of the jet age in the late 1950s, the FAA has always been able to successfully assimilate new aircraft into the NAS." 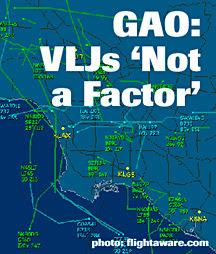 Both Sabatini and Michael Cirillo, vice president, systems operation services for the FAA's Air Traffic Organization, explained to the subcommittee that VLJs would fly at different altitudes and use different airports than airlines. They assured Congress that the FAA could safely integrate additional VLJ traffic into existing traffic flows. Reliever and regional airports had plenty of capacity for the small jets. As usual in this whole charade ATA is trying to engineer, they really want the public to look the other way so they won't see the truth about what is causing the delays today, and what will cause them tomorrow. It's not VLJ's guys, it's your carriers and their impossible schedules. It's the damn hub and spoke system, and I'm not ready to declare that even NextGen will fix that. What will fix it is having thousands of VLJs and LJs enter service, many operating as air taxis. Those new carriers will siphon off much of the prime revenue that keeps the major scheduled carriers out of bankruptcy court. Right now, the carriers are fat and happy, being the only choice other then wildly expensive charter for anything resembling "on demand" service. This whole "VLJs will darken the skies" rhetoric being spewed by ATA is their feeble attempt to keep the competition out of the market. And that, my friends, is the crux of this whole matter. It's not about Smart Skies or user fees, or flight delays, or about the level of service you can expect while riding in the back like cattle. It's about profit, pure and simple. Would you expect anything else from Corporate America? Not today, not in this America.